Published: Oct. 22, 2012 at 09:53 a.m.
Carolina Panthers quarterback Cam Newton said after his team's latest crushing loss that "something had to change." It didn't take long. 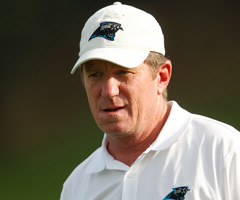 The Panthers announced Monday morning that general manager Marty Hurney has been relieved of his duties. He has run the team since 2002. "This was an extremely difficult decision," Panthers owner Jerry Richardson said in a statement released by the team. "Marty made every effort to bring success to the Panthers and took the team to a Super Bowl and two NFC championship games. Unfortunately, we have not enjoyed the success we hoped for in recent years. I have the greatest respect and admiration for Marty and will always appreciate the way he tirelessly served the organization." Brandon Beane, the Panthers' director of football operations, is handling the team's day-to-day matters on an interim basis until Hurney's replacement is named. "I understand the decision," Hurney told The Associated Press. "I'm responsible for everyone in the scouting department, on the coaching staff and in the locker room, and it all comes down to wins and losses." The Panthers had their share of success under Hurney, but it never was sustained. They followed their 2004 Super Bowl appearance with a 7-9 season. They went 12-4 in 2008 before falling to 8-8 the next year. The team's last playoff win came in 2005, and Hurney never was able to deliver back-to-back winning years. Things really went south after 2008. Hurney doubled down on Jake Delhomme's contract, which put his team in a huge hole. He got the Jimmy Clausen pick wrong. Outside of Cam Newton, the Panthers have very little to show for the last few drafts. Hurney went on a spending spree before the 2011 season to poor results. The Panthers have the NFL's highest-paid backfield with Jonathan Stewart and DeAngelo Williams. Their rushing attack is 24th in rushing attempts despite giving $43 million guaranteed to their top two backs. Whether it was John Fox or current coach Ron Rivera, Hurney and the coaching staff didn't always seem to be on the same page. "I am very fortunate to have been a part of one of the best organizations in the NFL since 1998," Hurney said in the team-issued statement. "As General Manager I will always regret not helping us win the Super Bowl or having back-to-back winning seasons. I hope this change starts accomplishing the direction to those goals. I understand this decision by Mr. Richardson and will always have an extremely close relationship with him. I consider him the best owner in the NFL. I am responsible for everybody in coaching, the players, the scouts and everybody in football operations. After six weeks, we are 1-5 coming off a 6-10 season." It's very unusual to fire a GM in the middle of the season, but this is Richardson's signal that change is coming to Carolina. It's also a reminder how difficult life in the NFL can be. The Panthers have lost four games by one score. If they complete another pass or two, Hurney still has his job.